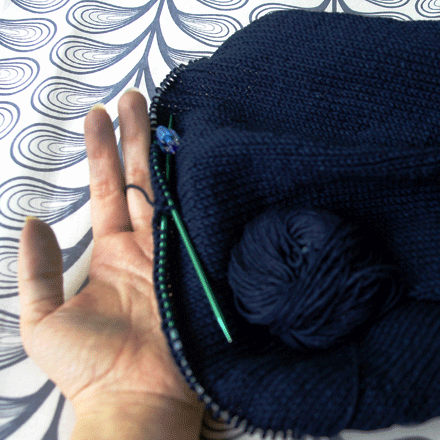 I decided one day that I had knit too many tops, socks, hats, gloves and scarves. I saw the Indigo Ripples Skirt in Interweave, and a skirt I would knit. Den-M-Nit Indigo Cotton is rope dyed; its dye coats only the surface of the yarn, ensuring that with wear and washing, the yarn’s white core will be exposed, enhancing your garment with a genuine faded jeans look. Dye may rub off on your hands and crochet hook, so it is recommended that you do not use a crochet hook that will stain. The dye will come off your hands when you wash them. As you can see in the photo, the dye will rub off on your hands. It is a great pattern, though. I even got complimented on the skirt by someone who stopped me on the escalator at the mall.